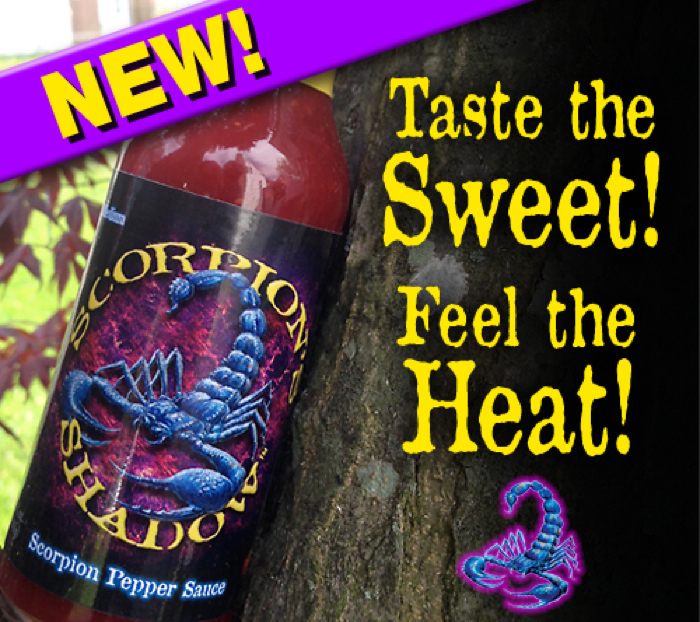 Tom and Diane Slosser of Tom’s Roid Rippin’ Hot Sauce bring a new look to their line of products with the introduction of Scorpion’s Shadow. 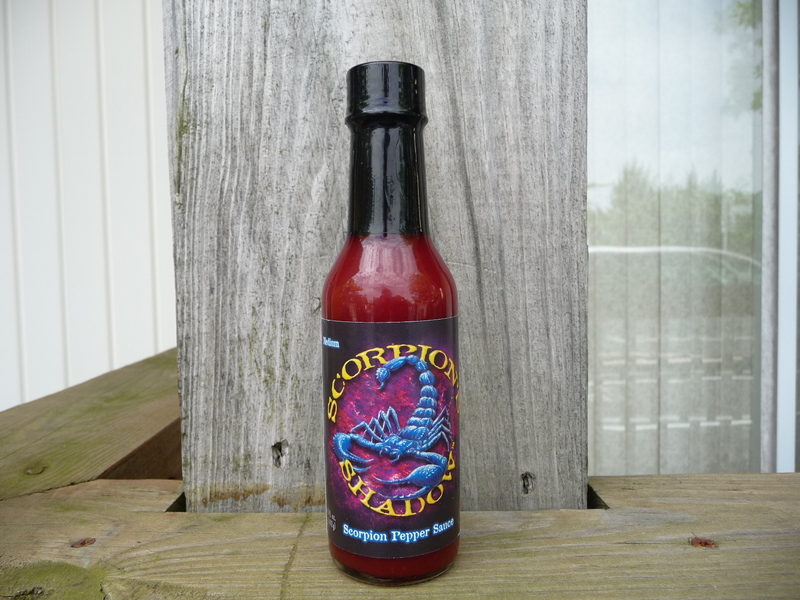 This fresh tasting sauce features Scorpion peppers, raspberries and strawberries, resulting in a unique flavor with just enough heat to warm the palate. 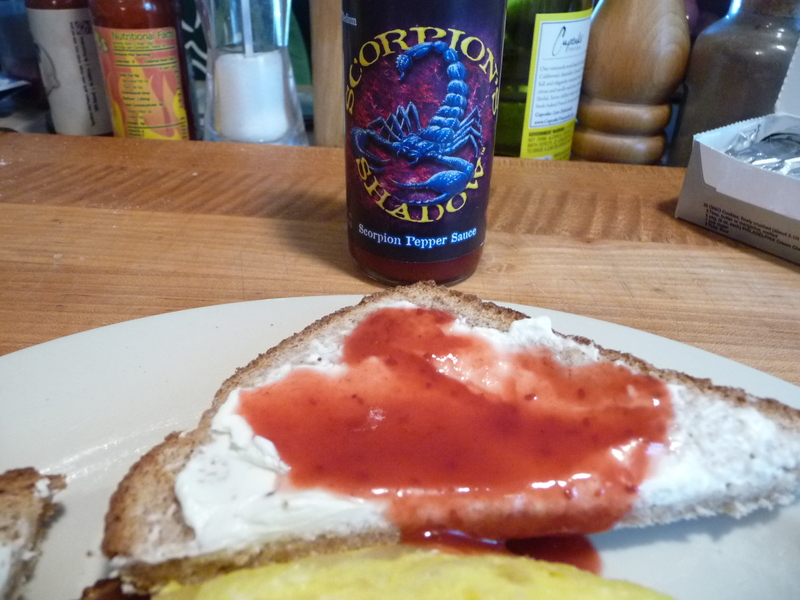 Scorpion’s Shadow – A Pepper Sauce or a Hot Sauce? Ingredients: Raspberries, Strawberries, Strawberry Jelly (Corn Syrup, Strawberry Juice, ALLERGENS: Sulfite), Apple Jelly (Corn Syrup, Apple Juice, Malic Acid, ALLERGENS: Sulfite), Apple Cider Vinegar, Water, Pineapple Juice, Soybean Oil, Scorpion Peppers, Vanilla Extract, Onion Powder, Lime & Lemon Juice, Garlic Powder, Ginger. 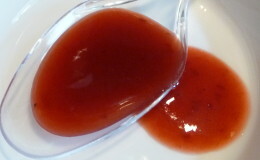 Texture & Appearance: This burgundy-colored sauce is rather thin, with a slight cling to the spoon and sides of the bottle. 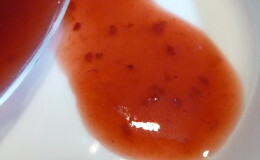 Seeds from the raspberries are apparent, along with bits of berries that add some pulp to the mix. Taste Straight Up: First taste is of the berries, sweet and fresh tasting (reminiscent of the flavor of my mom’s homemade jelly), followed by a rapid emergence of heat that moves to the back of the tongue and down the throat. The berry flavor then returns, and I’m left with a nice warm glow and the aftertaste of fresh berries. Thankfully the onion and garlic powders were not noticeable, though they probably play just a supporting role. I could have done without the raspberry seeds, but didn’t notice them as much after putting the sauce on food. 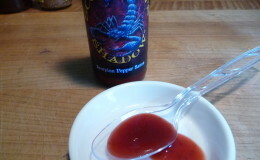 I really liked the flavor of this sauce. Overall flavor – . Label/Graphics: I love the label! 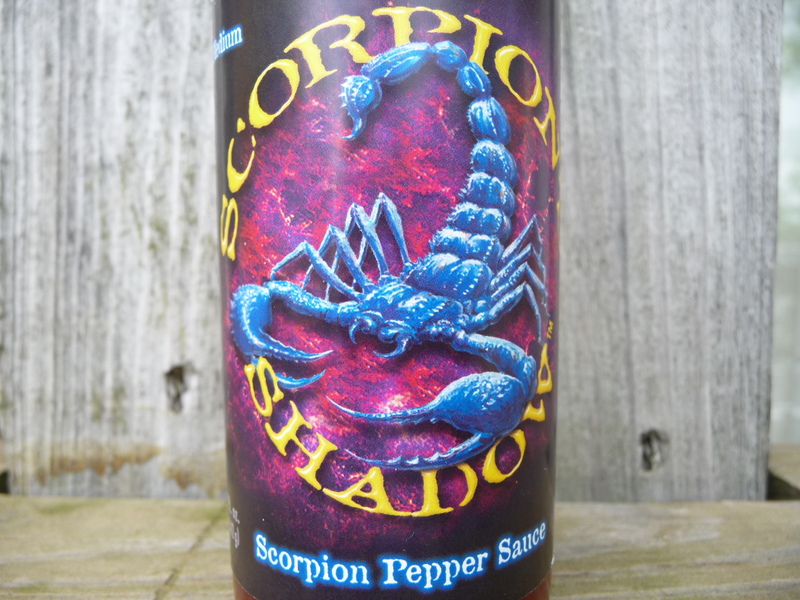 The blue scorpion on a background of red/lavender coals definitely catches the eye, and the yellow font used for “Scorpion’s Shadow” stands out on the black background. Very classy, and a nice departure from Tom’s “standard” style of label. . Overall Rating (Taste on Food, Final Thoughts): I first tried this sauce on Ritz crackers with cream cheese, but the crackers were too salty and destroyed the flavor of the sauce. Kudos to Tom and Diane for not only coming up with an innovative and delicious sauce, but for creating a label that is worthy of any gourmet or specialty store shelf. Classy and visually appealing, I believe this label design will help them market to an even larger customer base. 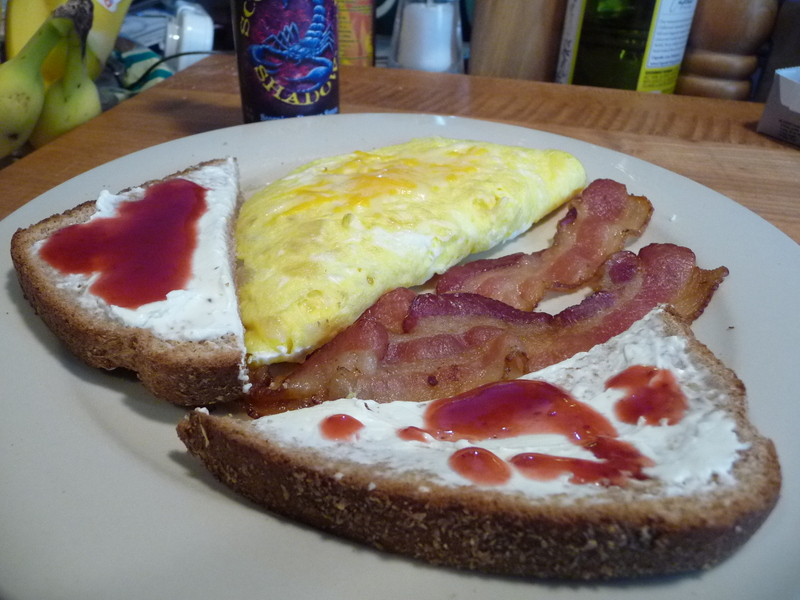 Be sure to visit Tom’s Roid Rippin’ Hot Sauce to purchase this and their other outstanding products (including their Hot Cherry Pepper and Roasted Garlic, a multiple award winner!) And tell them HotSauceDaily sent you!